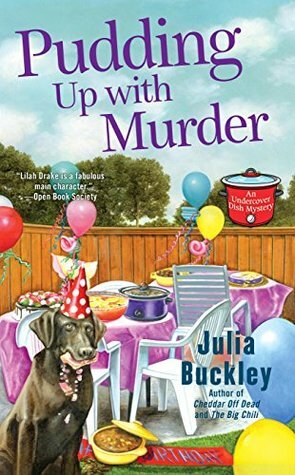 Secret chef Lilah Drake has a killer casserole to deal with in the latest Undercover Dish mystery from the author of Cheddar Off Dead....Customers trust Lilah Drake to keep her mouthwatering meals under wraps, but when a millionaire meets his untimely end, some sinister secrets become the main course. . . .
Pudding up with Murder by Julia Buckley is a 2017 Berkley publication. Lilah makes a ‘covered dish’ for her friend to serve at a birthday party for millionaire, Marcus Cantwell. Lilah attends the party with her adorable dog and meets the large, unusual, and the complicated Cantwell family. But, when Marcus keels over at his own party, it wasn’t from natural causes. Someone murdered him, and Lilah is afraid her pudding might have been the murder weapon. This is the third installment in the ‘An Undercover Dish’ series, but it’s my first. However, the book can be read as a stand alone, although, I do want to read the first two books in the series now that I see how enjoyable it is. While cozy mysteries can often feature a slight romantic side story, this one has a much stronger romantic element, which took up equal space with the mystery. But, the two elements blend well with each other beautifully. I enjoyed getting to know Lilah and Jay, as well as the secondary characters. The mystery is very puzzling, with plenty of suspects that kept me guessing all the way to the very end. This cozy mystery has everything in it, I enjoy about this genre. Pets, food, great characters I can grow to care about and think of as old friends, and a good old fashioned whodunit. I am definitely going to read the first two books in the series as well as eagerly anticipating the next installment. Visit Julia at her website, JuliaBuckley.com or her Facebook page, Julia Buckley Mystery Novels, or see her on Twitter @juliabucks. 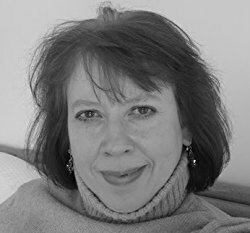 You can also explore her inspirations for Blue Lake on her Pinterest page, or follow her on Instagram at jellenbuckey.